UK unemployment fell to 1.68 million between November and January, down 28,000 from the previous quarter, the Office for National Statistics says. The rate of unemployment remained at 5.1%, maintaining a decade-low rate. Some 31.42 million are in work, 478,000 up on a year ago. The employment rate is 74.1%, the joint highest since current records began in 1971. Average earnings went up by 2.1% in the year to January including bonuses, 0.2% higher than the previous month. Excluding bonuses, the increase was 2.2%. "With the Chancellor [George Osborne] setting the backdrop to this afternoon's Budget as one where the global 'storm clouds' are gathering, today's labour market figures offer a ray of sunshine," said Scott Bowman, UK economist at Capital Economics. He added that the UK's jobs recovery remained "in full swing", but cautioned that wage growth was "still fairly subdued by past standards, especially considering how much the labour market has tightened recently". The East of England saw the biggest fall in the number of unemployed people, down by 15,000, followed by the North East of England, down by 11,000. However, Scotland saw an increase of 16,000 in the number of jobless people. The North East still has the highest rate of unemployment, at 7.8%, and the East of England has the lowest, at 3.6%. In all, 22.94 million people were working full-time, 302,000 more than a year earlier, while 8.48 million were working part-time, an increase of 177,000 on a year earlier. 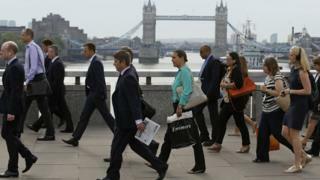 The number of people on the claimant count in February fell by 18,000 to 716,700, said the ONS. The unemployment figures are based on a large survey, so they are estimates rather than precise figures. For example, the figure of a 28,000 fall in unemployment has a margin of error of plus or minus 79,000, which means the ONS is 95% confident that the actual change in unemployment is between an increase of 51,000 and a fall of 107,000. Earlier this month, the US Labor Department said the US economy added 242,000 jobs in February, far better than the 190,000 expected by economists. The US unemployment rate remains at 4.9%, an eight-year low. Eurostat, the EU's statistical agency, has said the eurozone's unemployment rate in January fell to its lowest rate since August 2011. The jobless rate in the 19-country eurozone declined to 10.3% in January from 10.4% in December, while the number of people unemployed in the eurozone fell by 105,000 to 16.65 million.